This one of a kind towel was made using a wonderful soft towel. The towel has an eggplant, radish, pea, and tomato visible border. On the towel you will also find the words of some fresh vegetables, such as onion, tomato, peas, and carrots. The top part of this unique oven door towel was made from a wonderful vegetable fabric print. 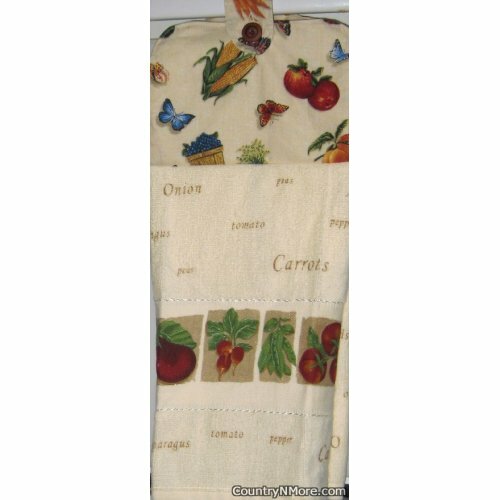 The top print has fresh corn, tomatoes, blueberries, and it even has some butterflies fluttering about. The fabric and the towel make this an unique and wonderful combination. We use full towels for all of our oven door towels and every oven door towel has a button closure.